· Customers can purchase HTC Jetstream, AT&T's* first 4G LTE/HSPA+ tablet, online and in company-owned retail stores starting September 4. 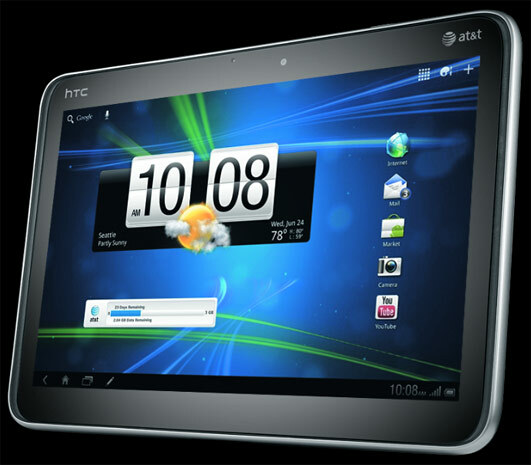 · HTC Jetstream is HTC's first tablet running on the Android™ 3.1 (Honeycomb) operating system which was specifically built for tablets. · Tablet features a 10.1" HD display, Snapdragon 1.5 GHz dual core processor and front and rear facing cameras. · For a limited time, HTC Scribe ™ - an optional digital pen accessory- will be available at no additional cost. Exclusive to AT&T customers, HTC Jetstream is the company's first 4G LTE/HSPA+ tablet. It runs the Android™ 3.1 (Honeycomb) operating system and represents the first iteration of the HTC Sense™ user experience on Honeycomb. HTC Jetstream boasts a large 10.1" WXGA high-resolution display for an immersive entertainment experience, third-generation Snapdragon 1.5 GHz dual core processor for fast multi-tasking and instant screen refresh. A rich web browsing experience supports Adobe® Flash® Player and an enhanced HD video experience with 1080p playback and capture. The tablet is also compatible with HTC Scribe™ - an optional digital pen accessory, which is sold separately, - for content creation as well as Evernote integration for storing your documents in the cloud. Additionally, HTC Jetstream is preloaded with services optimized for the tablet such as AT&T Family Map, AT&T Navigator ®, HTC Watch™, HTC Hub, Friendstream™, Android Market, and much more. HTC Jetstream is AT&T's first tablet to showcase the Android™ 3.1 OS. The brand new operating system was designed from the ground up for devices with larger screens. It improves on Android favorites with new interactive and resizeable widgets plus improved multi-tasking, browsing, notifications, and customization. The new version of the platform also features Google Maps 5.0 with 3D-like interaction, access to over three million Google eBooks, incognito mode for browsing internet with no history tracking and Google Talk with video chat over Wi-Fi. "This tablet is a beautiful 10.1-inch, LTE powered masterpiece," said Jeff Bradley, senior vice president, Devices, AT&T Mobilityand Consumer Markets. "When you combine powerful options like HTC Jetstream with our upcoming LTE technology and nationwide HSPA+ network, it flies." "HTC Jetstream combines the acclaimed HTC Sense experience with Android Honeycomb to provide an innovative and engaging experience on a 10.1 inch tablet," said Martin Fichter, acting president, HTC Americas Region. "Paired with AT&T's upcoming 4G LTE speed and mobility, HTC Jetstream delivers connectivity for social and entertainment needs alongside productivity and creativity tools in a portable package." · Postpaid: $14.99 for 250 MB or $25 for 2 GB. Customers on the 2 GB plan who exceed their monthly data allotment will be charged $10 per 1 GB of overage. Charges will appear on customers' monthly wireless statements. · Prepaid: $14.99 for 250 MB or $25 for 2 GB. Customers on the 2 GB plan who exceed their monthly data allotment may choose to purchase an additional 2 GB for $25. Charges will appear on customers' credit card statements. For more information, please visit www.att.com/jetstream.